Indian researchers have developed a gel when applied on the skin, can inhibit some pesticides from getting absorbed into the body, and would help preventing serious adverse effects and even death. The gel was developed by a team led by Dr. Praveen Kumar Vemula from the Institute for Stem Cell Biology and Regenerative Medicine, Bengaluru. Organophosphate-based pesticides, commonly used by farmers in India, penetrate through the skin and affect the nervous system and heart, and cause cognitive dysfunction. Active ingredients of the gel are attached to chitosan (a substance found in the hard outer shells of crab and shrimp) so the gel does not penetrate the skin. Ayush Ministry is to develop parameters to certify Yoga professionals at various levels. The Chairman of the steering committee and Yoga Guru Ramdev said the scheme aims at certifying the competence of yoga professionals and institutions meeting the prescribed standards. Around 2 to 3 lakh people pursuing yoga will be given certificates in the next 4 years. Instructors, trainees, teachers and masters are the categories in which people will be given certificates. Minister of Communications Manoj Sinha has said that Indian telecom industry will rollout one million WiFi hotspots in the country by December next year. He said, it is another step towards the digital empowerment of the nation. Addressing the Indian Mobile Congress in New Delhi, the Minister said, this initiative will allow consumers to access Wi-Fi Hotspots of any of the partnering operators. A parliamentary committee has been examining the Citizenship (Amendment) Bill, 2016, which proposes to grant citizenship to six persecuted minorities: Hindus, Jains, Sikhs, Parsis, Christians and Buddhists who came to India from Pakistan, Afghanistan and Bangladesh before 2014. India’s first made-in-India engineless train ‘Train 18’is set to hit the tracks for trials on October 29, 2018. The train will be unveiled on October 29 for three to four days trial outside the Coach Factory’s premises. After successful trials, the train will be handed over to Research Design and Standards Organisation (RDSO) for further trials. A Chinese company has tested the ‘world’s largest’ cargo drone Feihong-98 (FH-98) which can carry a payload of 1.5 tonnes (1,500kg). The FH-98 has a maximum takeoff weight of 5.25 tonnes (5,250 kg) and maximum range of 1,200 km. Further, it is capable of reaching a flying altitude of 4.5 km and a cruising speed of 180 kmph. Sri Lanka was chosen as the best travel destination among the list of countries to visit in 2019 with Germany and Zimbabwe just behind. The country topped the list primarily because travel becomes much easier there since the civil war ended in 2009. India and Bangladesh have signed several milestone agreements for enhancing inland and coastal waterways connectivity for trade and cruise movements. Bangladesh agreed to open its Chattogram and Mongla ports for trade with India. Ethiopia on appointed diplomat Sahle-Work Zewde as its first-ever female President. The position of the President is largely ceremonial in the nation. Russia has successfully launched a Soyuz-2.1B rocketfor the first time since the failure of a similar rocket aborted a manned take-off to the International Space Station (ISS). According to Russia’s space agency chief Dmitry Rogozin, this was the first launch of a rocket from the Soyuz family since the October 11 accident. The Gujarat government declared 51 talukas, comprising 3,291 villages, as scarcity hit owing to scanty rains. Deputy Chief Minister Nitin Patel said in Ahmedabad that 10 talukas of Kutch district. IDFC Bank on proposed to change its name to ‘IDFC First Bank Ltd’ in the wake of its amalgamation with the non-banking financial company Capital First. The decision was taken during the meeting of the Board of Directors of IDFC Bank. The overseeing committee (OC) that is being set up under the inter-creditor agreement (ICA) for resolution of stressed assets will have six members, including Janki Ballabh (former Chairman, State Bank of India), MBN Rao (former Chairman & Managing Director, Canara Bank ), M Damodaran (former Chairman, SEBI) and HR Khan (former Deputy Governor, RBI). The OC also includes a senior Tata Group executive with expertise in the power sector and a Bombay High Court Judge, said a senior public sector bank official. Athletics Federation of India will be awarded the FICCI (Federation of Indian Chambers of Commerce and Industry) India Sports Awards 2018 for the category of Best National Sports Federation (NSF). The award will be presented at the India Sports Awards ceremony, at Federation House, New Delhi. The Jury for the awards was chaired by Justice (retd) Mukul Mudgal. Pankaj Singh is the sports head of FICCI. 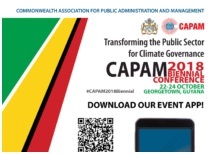 India has won Commonwealth Association for Public Administration and Management (CAPAM) Award, 2018. The award was announced at Annual General Members Meet held at Georgetown, Guyana. UNESCO MGIEP(Mahatma Gandhi Institute of Education) in association with Government of Andhra Pradesh announces TECH 2018, an international conference which aims to showcase the role of games and digital learning in enabling a shift from “transmissive pedagogies” to “transformative pedagogies” to create peaceful and sustainable societies. The three-day event will be held from 15-17 November 2018 at Novotel, Vizag City, Andhra Pradesh, India. UNESCO MGIEP is the first UNESCO the first category 1 institute in the Asia-Pacific region focused on mainstreaming socio-emotional learning in education systems. The 2018 WETEX (Water, Energy, Technology, and Environment Exhibition) has started at the Dubai International Convention and Exhibition Centre in Dubai from October 23. It is considered as one of the leading sustainability exhibitions in the Middle East and North Africa region. The second edition of India Mobile Congress (IMC-2018) was held New Delhi from October 25-27, 2018. It was organised by Department of Telecommunications (DoT) and Cellular Operators Association of India (COAI). The theme was “New Digital Horizons. Connect. Create. Innovate”. Dr Jitendra Singh inaugurates 10th Nuclear Energy Conclave. The theme of the conclave is ‘Nuclear Power- Towards a Clean & Base Load Energy’. Prime Minister Narendra Modi inaugurated a farmers’ conclave ‘Krishi Kumbh 2018’in Lucknow, Uttar Pradesh via video conferencing. The three-day ‘Krishi Kumbh’ is being organized to promote modern technique and diversification in agriculture that could help in doubling farmers income. The Minister of Human Resource Development, Shri Prakash Javadekar launched the web portal of the Scheme “Scheme for Promotion of Academic and Research Collaboration (SPARC)” in New Delhi. The railways ‘UTS mobile’ app for buying unreserved tickets online will be launched nationwide on November 1, 2018. It was first launched in Mumbai because a large number of people travel in locals. India will be the third largest aviation market globally a year sooner than was earlier predicted. It is now expected to be among the top three countries by 2024 from its current seventh position, according to global aviation body IATA. NATO’s biggest military maneuvers began in Norway that involves restoring the Scandinavian country’s sovereignty after an attack by a “fictitious aggressor.